‘Sincerely Yours - The Vera Lynn Story’ will take you on a journey through the career of the forces sweetheart, who captured the hearts of a nation during the 1940s. The show includes many of the songs she would have sung whilst performing with the likes of Joe Loss and his orchestra, through to the blockbuster hits which propelled her to international stardom, including ‘White Cliffs of Dover’, ‘A Nightingale Sang in Berkeley Square’ and the timeless classic, ‘We’ll Meet Again’. The role of Vera Lynn will be performed by Lorrie Brown. Lorrie has been performing a tribute show to Dame Vera Lynn for over 25 years, and in 2013 she was named the UK’s No.1 Vera Lynn tribute by the Agents Association. After Dame Vera heard of Lorrie’s award, she invited Lorrie to meet her at her home. Lorrie says, “It was both a dream and terrifying, I have performed in football stadiums to 33,000 people and sang in some of the country’s finest theatres, but this was the most nervous I have ever been! In the end she was a perfect host. As soon as I entered the room she gave me a hug and congratulated me on my award. She was just so happy that I was keeping her music alive.” “We sat and talked for 3 hours about her time entertaining the troops, and especially about her time in Burma, she had a very strong connection with the troops in Burma and she was so proud to have been allowed to go out and entertain them”. This matinee show comes complete with tributes to other 1940’s acts, such as George Formby, Max Miller, Harry Lauder and Marie Lloyd. It will also feature video footage from the 1940’s, as well as some personal memories from Dame Vera herself, and will finish in a rousing patriotic finale guaranteed to have everyone waving their flags with pride. Sincerely Yours - The Vera Lynn Story is at The Apex on Tuesday 28 November at 1.15pm. 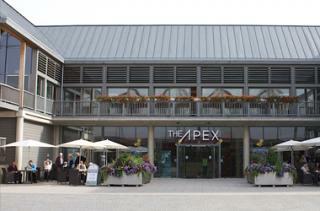 Tickets are £17.50, ring the box office on 01284 758000 or see the website, www.theapex.co.uk for details.